So many people thought the last blog post was wrong that I need to take it seriously. Several Europeans who claimed direct knowledge of the traffic in that McDonalds in Milan suggested it was profitable. One person tartly tweeted that my post was from the "Thomas Friedman school of observing something inconsequential and developing an unverifiable explanation". Here is the P&L from McDonalds in 2014. I am assuming this was a company owned store - and I will not allow any of the generalised SG&A to be billed back to this store. Company stores had 18.17 billion in revenue and 15.29 billion in direct costs (listed as food and paper, payroll and occupancy etc). This is about an 18 percent margin. This store was (ignoring Venice*) in the most expensive place to operate in Northern Italy. I roughly knew these numbers and it was almost inconceivable to me that this store isn't 18 percent worse than the average MickeyD's in terms of operating costs or the like. That suggests the received wisdom about the lack of competitiveness of certain European countries (and the need for an internal devaluation or deflation) is wrong. Staggeringly wrong. Now whilst I am bullish on many European names and I am here looking for prospective investments but I am far from that bullish. I come from another expensive country (Australia) where cost-competitiveness doesn't look all that good. McDonalds has only closed a few stores - but it has downsized several in high cost areas near me. A small high-cost store seems to be acceptable. A large one, not so much. The store in the high-cost but highly trafficked Bondi Beach is small. It never looks profitable, but I may be wrong there too. *Venice is a frighteningly expensive special case at least in part because the logistics are difficult. How do you know Bondi isn't profitable just by looking at it? Why can't we assume the stand-alone McD in the middle of nowhere operate at a much higher margin than the average? People expect a McD in Bondi, so there is value in that location. Closing down George & Bridge removes a store in between Pitt St and Circular Quay, and this one is much more telling. That too was a premium location, but suffered from much more competition from the thousand burger places that have popped up (The Morrisson and Riley st Garage are within 50m on McD). This shows they aren't willing to hold onto prime real estate for the sake of it? While the appended news story implodes the idea that the building is owned by FRC, I too have noted that the McD's is routinely busier than the Duomo it faces. Did you know there used to be a Micky D's in Vittore Emanuele itself? The posh mall in your photo. 10rs ago? - pre-recession anyway. Popular meeting point for teenagers as they could afford it - you have to pay extra to sit down for a coffee in Italy, and it's a fortune in place like that. In Micky D's they could buy a burger and chat all day. It closed not because Micky D's wanted to close it, but because the landlord thought it was lowering the tone and wouldn't renew the lease. Now whether Micky D's wanted to keep it as a vanity project even back then, or whether it was actually making money, I don't know. Why do you think McDonald's can't pass on higher operating costs to consumers? Having lived in both NYC and Baltimore I can tell you the price of their food correlates with the price of everything else in the locality. Also, if staffing isn't a simple linear function of sales, there may be economies of scale to large high traffic stores that justifies paying expensive rent. I don't get the bit about being wrong on the need for internal devaluation/deflation. 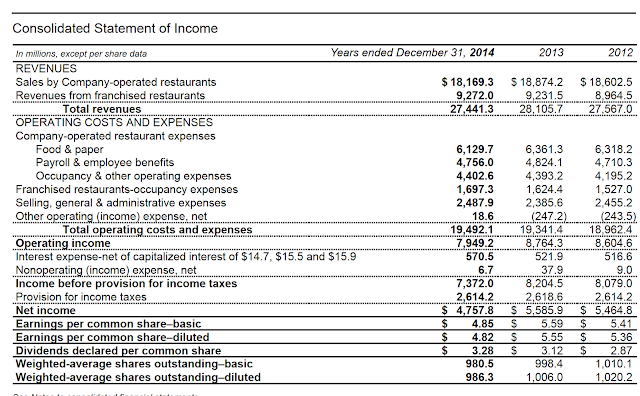 I would expect this McD's revenues and costs are mostly in euro. Currency movement will have no effect on its profitability. Then, how does its lack of profitability lead to the conclusion that the need of internal devaluation/deflation is wrong? There was no borrow available anyway right? I checked with JPM's desk and they had nothing available as of a month ago. I thought that was odd given the MC of the company but the story was out there so I would guess demand was high. I was at that McD just recently and left soon after as I had to wait 15 deep in the queue. It was that popular, tourists and locals. Those few minutes there does not suggest to me it is minting it year round, but neither should you draw the line to say it is not profitable based on a few minutes observation. In the meantime, will let your run with this one! I was talking to an Aussie friend in Berlin, he used to work at McDonalds. His information will be several years to out of date. But he said the financial information communicated to the staff suggested that McD US operations were the problem, and McD's Australia was one of the most successful countries. Didn't mention Europe, but broadly I think McD's will struggle to adapt to changing tastes. And never understood why they went for the most upmarket areas of town. Airports and train stations I can understand - but not the store you have taken a photo of. Sorry that you can't make it to camp Alphaville. Whatever happened to that mining company you presented on last year? 2) McDonald's occupies two levels within a high-ceiling building. The regular menu is on the ground floor and the McCafé is on upper (there was 1 observed customer at the McCafè, although it was lunch to be fair). Point is, they operate with more staff and a cranking AC in a nice, big building. (there was a small Italian cafe right next door that also serves Gelato: the line was out the door). 3) McDonald's operates longer hours than BK. To be precise 32 more hours per week (Mon - Sun from 0700 to midnight. Burger King, daily 10:30 to 2245, but Saturday open until midnight.) While I cannot comment on how busy/not busy these morning and late night hours are, it is still fair to assume that the lights are on, the deep fryers bubbling, the AC cranking, and the workers charging time. 4) The Burger King menu is about 1 Euro more per item than the McDonald's menu (most expensive item MCD: 6.90EUR - BK: 7.90EUR, about 14% less). It's not clear why this may be, if this is a systemic difference, or what? 5) To your original point, the McDonald's sign makes quite a spectacle amongst the already spectacular setting. To put this into further context I took a similar photo you did, except I zoomed the frame out to capture the arched corridor the McDonald's is precisely centered. Within the same frame two iconic fashion symbols flank the Maccas, Louis Vuitton on the left, and Prada on the right. Without any mention of my little side project, my very Aussie mother-in-law from Sydney's Northwest exclaimed, "wow, what a statement" as we trekked along Vittorio Emanuele ii. These contrasting operations made me curious, which led me to bloomberg. Alas, another synchronicity at play. I once owned a modest amount of MCD, which I held from 2012 to about mid-2013, but had to dump (personal reasons) at a zero gain after dividends and inflation. I wish I could display the chart here, but here is a link: http://www.bloomberg.com/quote/BKW:US Compare MCD, on the 5-year. Note the massive performance difference. Hindsight is indeed 20-20, but BKW was clearly the burger chain to own. To stave off an analytical leap of epic proportions, it's fair to point out that one situation in Milan is not some sort of material reflection on either company as a whole, but there are some anecdotal implications worth exploring. After a preliminary look I cannot help but wonder if there is a failing strategy within MCD, and if it is the reason why the stock has not grown for 3 years? I part with the final synchronicity.